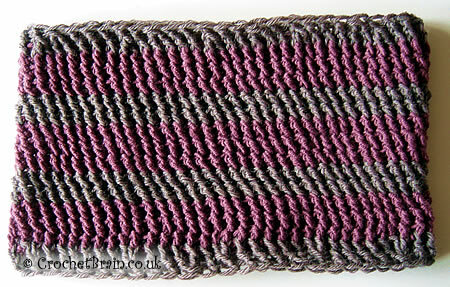 This cowl is the result of experimenting while swatching with some left over yarn. You may be familiar with front raised crochet, also known as back post crochet. This design came from wondering what would happen if the hook was inserted in a slightly different way. The resultant fabric is more springy and 3 dimensional than standard front raised treble crochet. Yarn over hook and pull through 2 loops on hook. Yarn over hook. Insert the hook, pull yarn through. Yarn over hook. Insert the hook in next stitch, pull yarn through. Yarn over hook and pull through all 3 loops on hook. 12 stitches per 10cm in modified front raised treble crochet. Foundation chain: Using main colour, chain 70. 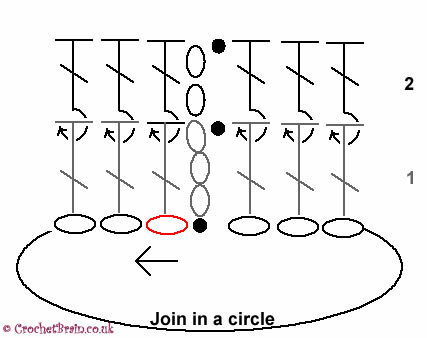 Join to form a ring by making a slip stitch into the first stitch in the chain taking care not to twist the chain. Round 1: Chain 3. Crochet a treble into each stitch of the foundation chain. Make a slip stitch into the 3rd of the 3 chain at beginning of this round. See diagram left. Round 2: Chain 2. Work in modified front raised treble crochet to the end of the round. Make a slip stitch into the 2nd of the 2 chain at beginning of this round. Round 4-5: Using contrasting colour, repeat round 2. Rounds 6-8: Using main colour, repeat round 2. Round 9-10: Using contrasting colour, repeat round 2. Rounds 11-13: Using main colour, repeat round 2. Rounds 14-15: Using contrasting colour. Chain 2. *Work standard front raised treble crochet into next 5 stitches, decrease one stitch over next 2 stitches. * Repeat from * to * to end of round. Make a slip stitch into the 2nd of the 2 chain at beginning of this round. Edging: Using contrasting colour work into base of foundation chain. Chain 2. *Work standard front raised treble crochet into next 5 stitches, decrease one stitch over next 2 stitches. * Repeat from * to * to end of round. Make a slip stitch into the 2nd of the 2 chain at beginning of this round.